Generally speaking the larger a Life object is, the less likely it is to arise from a random soup. Going by the current Catagolue census, for instance, gliders arise in Life 684 times as often as lightweight spaceships, which are seen 3.8 times as often as middleweight spaceships, which turn up 5.8 times as often as heavyweight spaceships. Or look at the statistics page: All of the still lifes of size up to 13 have arisen, and 616 of the 619 size 14 still lifes, but only 1256 out of 1353 size 15, 2484 out of 3286 size 16, 4199 out of 7773 size 17 and so on… to only 7769 out of 4,051,711 still lifes of size 24. Now, the smallest known Life spaceship that isn’t a glider, a *WSS, or a flotilla of *WSSs is the loafer, which has population 20 in a 9 by 9 bounding box. For comparison the HWSS is 13 cells in a 7 by 4 bounding box. There are 2^81 possible states for a 9 by 9 box versus 2^28 for a 7 by 4, or 2^53 times as many — about 9 quadrillion. From that point of view it’s not too surprising no loafer has evolved naturally from a soup so far. Only 111 trillion objects have been seen so far, after all. So what are the odds of natural occurrence of a population 49 spaceship in a 47 by 17 bounding box? Incomprehensibly tiny, you would think — never in many times the lifetime of the universe would it happen. Well, so you might think, anyway. Evidently that thinking’s not entirely correct: Because that pattern evolved, not in Life but in the Life-like B38/S23, from a random D2_+2 soup, on my computer in the past few hours. It may not look like much… but it’s a spaceship. 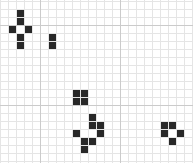 A spaceship which in 190 generations travels obliquely, 5 cells up and 2 cells to the left. I was pretty excited by this discovery, until I checked the census for B38/S23 C1 soups, and saw that a bunch of p190 ships have been found already, the first by David S. Miller last April. Then I found out, well, re-found out these ships had been discussed extensively in a forum thread shortly after that. A thread which I read. And forgot about. All these ships are based on the same fundamental engine. Take a look at the part on the right of the above ship. 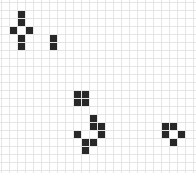 Run just that for 190 generations and you get this: Three of the pieces of the original pattern come back, shifted by (5, 2). The fourth piece gets changed. So this is a near spaceship by itself. Now if you look at the part on the left and run that 52 generations you get: The same thing as the right half at generation zero, minus the boat. So the ship consists basically of two out of phase copies of a single engine, plus a boat, evolving in such a way that the interaction between them makes up for the lack of a boat for the left engine, and changes the evolution of the 7-bit piece in both engines to make it recur in 190 generations. Another way to look at it: Start with an R pentomino and a boat: After 192 generations you get this: And if you add a second R pentomino in just the right place at just the right phase, it’ll react with the first R and boat in just such a way as to make a spaceship. Seems kind of miraculous, but in fact there several ways to accomplish it. According to David S. Miller, at least 692 ways. Of which, as of today, apparently 11 have turned up in soup searches. There are also another 120 combinations of two Rs and a boat that produce puffers, rakes, and so on. So a 47 by 17 spaceship evolving naturally? Not quite as astronomically unlikely as it looks. A remarkable system, though, and there’s nothing like it known in Life. Yet.